Stuff like this is where I worry all of this as an attempt to replace the animated versions. This has yet to happen with any previous movie, and is certainly not going to start with this one. yeah but I think those used live action images from the films and promo shots. Exception was for some of the graphic novel adaptations. This and Lion King LA are gonna have a lot of merch with newly made bright cartoon designs based on the new films. But I hope all of you are right. I really don't want the classic character designs replaced. 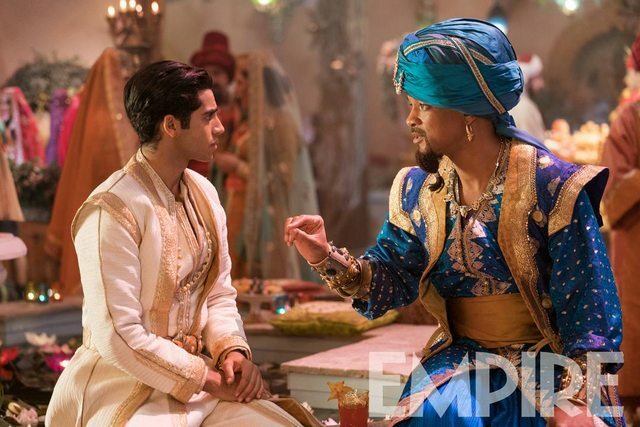 When the first look at Smith’s Genie arrived in a teaser trailer in February, the internet responded as it tends to do: with copious memes. From Genie-Shrek hybrids, to Arrested Development ‘I blue myself’ gags, and Papa Smurf Photoshops, there was a slew of images involving Smith's Genie. It's really fortunate how good the new songs for the remakes turned out to be. Evermore, Days in the Sun, and now Speechless are among my favorites in the Disney canon. It just goes to show that Menken never lost his touch. He had just been sidelined and underutilized. I completely agree, he continues to make amazing songs. I wish Disney would realize that and value him more, but yes, we are lucky that at least they're hiring him for the remakes. For me the new songs are the best thing about them. "Evermore" is definitely among my favorite Disney songs as well. I also like "Days in the Sun" very much, and "Speechless" will probably be among my favorites too. And we still haven't listened to the second new song in the movie. Thank you so much! You caught a lot more words than me. There are some parts that are quite difficult to understand, but I think you probably got most, if not all of it right. I really like the lyrics so far and how they show Jasmine can't stand her situation any longer. Naomi Scott also helps to convey it with her performance. Oh you mean because the past live-action films always used the actors themselves on the merchandise whereas Aladdin and TLK are using cartoon versions of the live-action characters for merch. I agree that this is new for Disney but I don't really think it has any nefarious ramifications. I think the original live-action 101 Dalmatians used to use the cartoon Cruella in the live-action outfits for a lot of storybooks and other items. yeah that's what I meant and I do remember how they'd use Cruella from the animated films in the live action merch and the puppies looked like the ones from the animated films too, for the most part(I think some may have had their spots done more like the LA film?) I actually wouldn't mind if they'd do something like that for the LA Lion King and Aladdin merch, like having new LA merch have the animated versions of the characters wearing the new LA costumes, I think that would be kinda neat. But I could also see how it could be confusing. One Jump Ahead has been given a major pop, Bollywood updated sound-wise. It fits the song well, and works with the action in a great way. The song also now takes place right as Aladdin helps Jasmine escape from the market place after trying to help the starving kids. It’s all there, there’s some new lyrics though nothing major. And it all works fairly well other than a little bit of odd pacing shot-wise. Some of the cave of wonders scene was also shown when the Genie first appears. Definitely it’s own vibe, humorous without all the pop culture, which I think works in its favor. Thanks for letting us know, nomad2010! What you said eased my concerns about the songs being updated. No problem! I think you and everyone will be pleasantly surprised. It’s just a poppy orchestration. Very Greatest Showman, but still true to the original and keeps the cultural element as well. I’m excited to hear the soundtrack version for sure. I'm really excited to hear the new renditions of the songs. Thanks for sharing! That would be neat actually if they made Aladdin and Jasmine in the new merchandise look more like the animated versions, just with the live-action clothes.